Michael MacCauley (Liam Neeson) is a former police detective turned insurance salesman. Each day he takes the Hudson line into New York City and back again, sharing his train with a familiar group of fellow passengers. One day Michael is unexpectedly laid off from his employer. On the way home, he is approached on the train by a strange woman (Vera Farmiga) who offers him $100,000 in return for completing a simple task. This task, however, turns deadly, and the lives of Michael and his family are soon at stake. Of course 15 years ago, The Commuter would have starred Harrison Ford in his patented shouty ‘give me back my family! !’ persona. Five years ago, it would have starred Liam Neeson – in fact it essentially did, with Neeson playing the protagonist in Jaume Collet-Serra’s plane-set thriller Non-Stop. Swap out the plane for a passenger train, and swap out Neeson for a slightly older Neeson, and make everything particularly non-essential and boring, and you have The Commuter. It’s technically competent, in that it has a beginning, middle, and end, and nobody accidentally set the production on fire, but ultimately it is so weirdly unambitious that even mediocre films outpace and outclass it. This is all despite what should be a great supporting cast, one that includes a mini-Conjuring reunion between Vera Farmiga and Patrick Wilson, and modestly-sized appearances by Sam Neill, Jonathan Banks, and Elizabeth McGovern. There are plenty of commendable ingredients to the film – Collet-Serra has a good visual eye, and the confined train setting has a lot of promise – but they simply do not add up to anything of worth. The cast look bored. The film looks and feels like the people making it were not sufficiently engaged. Collet-Serra continues playing around with digital backgrounds, as he did in Non-Stop and The Shallows. In the latter of those two films he used the technique to gain more control of how his film looked, and it worked particularly well. Here it looks unconvincing and lazy, as if he simply could not be bothered achieving any sort of realism. Still, things move. People shout. Punches are thrown. Guns are fired. The Commuter is the lowest-common-denominator thriller, in which sufficient viewers are thrilled by sound and fury and do not actually anything so tedious as an explanation or three-dimensional characters. Liam Neeson is clearly just collecting a pay cheque on this film. He frowns generically. He growls with casual intensity. He proves excessively violent for an insurance salesperson. The film simply gestures at genre convention without ever providing a context or a back story. It literally tells us that there is a government conspiracy and a critical witness, but does not bother to explain precisely what crimes have been committed or who committed them, or even why something benefitted from the crimes. The screenplay (by Byron Willinger, Philip de Blasi, and Ryan Engle) assumes a large enough audience simply will not care. With a US$200m global gross from a US$40m budget, it seems likely they have a point. 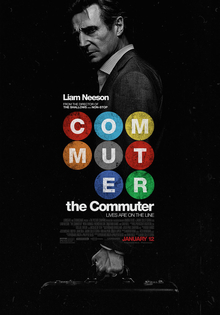 If you have a specific penchant for Liam Neeson shouting at people and punching them in the face, then The Commuter just might hold enough entertainment value to satisfy. If you are even barely discerning, this empty shell is a cynical waste of your time. It’s not a cinema film, as we used to say when I was a kid. It’s not even worth a weekly video rental.